Japan, home to almost half of the world's 800,000 industrial robots, has also developed models that can care for its fast-growing elderly population. 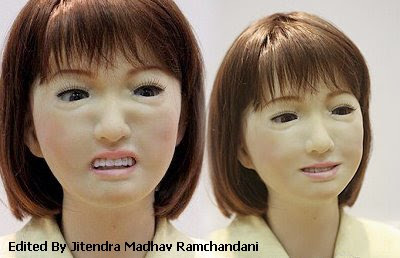 However there is still a long way to make a truly robotic model. 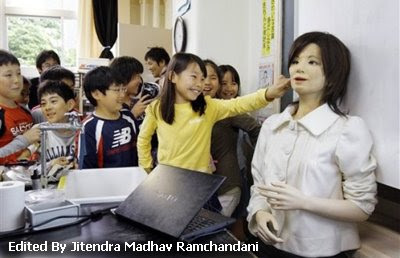 Professor Hiroshi Kobayashi of the Tokyo University has created a humanoid robot which is capable of teaching students while also expressing a range of emotions. She is named Saya and has been designed to look like as human a form as possible. Saya has 18 facial motors or say programmed movements which give her the ability to imitate some human emotions while speaking multiple languages. (Multi-tasking). She is able to express basic emotions like surprise, fear, disgust, anger, happiness and sadness. Saya is capable of teaching Science and Technology and can be remotely controlled. She can do roll call and as well set tasks from textbooks. She has also taken a class in a Tokyo school. She taught a science lesson to class of 10 year olds at Kudan Elementary School. And she proved a hit on her first day. Yay! Saya has already worked as Receptionist and Secretary and the plan to program her further to personify as a school teacher already begun 5 years back. 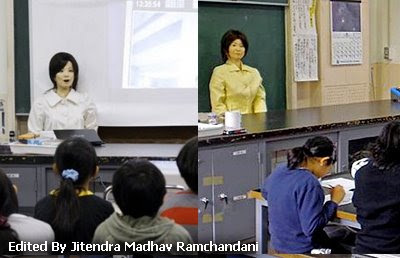 Creating such humanoid robot teachers will definitely benefit Japanese schools where there is shortage of human teachers, says her father – Prof. Kobayashi. That made-to-order robot will cost about 5 million Yen, he said.